Due to past testing, a hypothesis was developed that the fibers in the paper were prohibiting the bonding of the silver nano particles and therefore no electrical connection was forming. Transparencies were then obtained to test this. The transparency sheet had two different sides to it. One side of the sheet was coated with a "quick drying" agent while the other was left plane. Both sides were tested and compared to paper. The test was composed of printing a series of alternating colored lines (Black, Yellow, Magenta, and Cyan) and testing for conductivity (Fig. 1). The was an immediate, noticeable difference between the printed ink on the different substrates. The paper substrate (Fig. 2) appeared to have varying shades of black printed on it. The ink on the non-coated side of the transparency was still moist and gold in color (Fig. 3). The ink on the coated side of the transparency was very uniform in color and gave off a silver, metallic shine (Fig. 4). The colors could be seen on the reverse side of this same sheet however (Fig. 5). None of these substrates were found to contain printed lines that were electrically conductive. These substrates were then analyzed under a microscope to look for clues as to their lack of conductivity. Figure 6 shows the paper substrate and the individual fibers being visible. Figure 7 and 8 show a zoomed in view of the lines of the non-coated side and coated side respectively. Figure 8 appears to be a very consistent print job with only minor gaps within the lines. It seems a lot more plausible for it to be able to conduct electricity than the paper in Fig 6. More tests will be conducted with subsequent prints to see if that can affect the conductivity. It was then noted that there appeared to be residue of a fingerprint on the coated transparency (Fig 9). This was due to improper handling of the substrate without gloves. 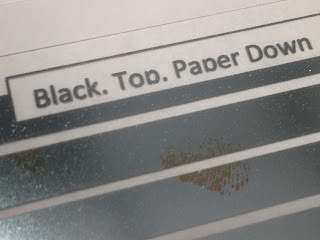 However, upon closer inspection, the lines of the fingerprint that had been printed on were conductive! Under the microscope it was observed that fingerprint residue had caused the ink to turn from silver to gold (Fig 10). The conductivity of the fingerprint test was repeated and successful. In the ink's product manual it states that dry or arid conditions may prohibit the formation of conductive traces. Future tests will be run to try to print in a more humid environment or with moistened substrates as this has suggested to lead to conductivity.